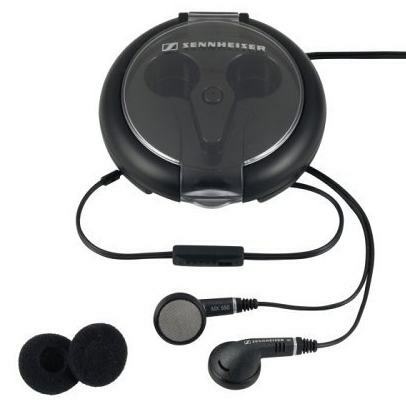 About a year ago I bought the Sennheiser MX 550 earphones for my MP3 player. After using a pair of Sony earphones that came with my Sony Walkman for more than 6 years the right earphone suddenly stopped functioning. It's kinda annoying to only hear the left channel of music so I decided to buy a new pair of headphones. 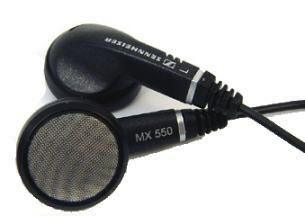 I did some research on the web and decided to go for the Sennheiser MX 550. I knew Sennheiser delivers high quality products and I was attracted by the special volume control function. I bought the MX 550 earphones for about 27.95EUR at a store, they arrived in a nice package which included a wind-up pocket carrying case. Nowadays they are probably a bit cheaper. The sound quality of the Sennheiser MX 550 is superb. I use them to listen to MP3s on my digital audio player or while watching movies on my laptop. The sound is very clear, the MX550s sound a lot better than the crappy earphones that are included with most MP3 players. These earphones are also quite light and feel pretty comfortable with the foam pads on. Last year I sometimes used them for more than 1.5h and afterwards my ears didn't really hurt. One of the features I like about it is the inline volume control. It's a very easy and convenient way to lower or increase the volume of the song your listening to. Unfortunately the volume control started malfunctioning after a few months. 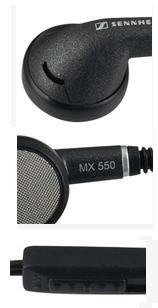 The volume control on the MX550 is just a simple variable resistor and if you use it a lot it quickly wears. In my case I experience a cracking noise while changing the volume and when I set the volume to about 90-95% it suddenly sounds quiet, like it's only on 25%, but on 100% it sounds normal again. The volume control started malfunctioning after a few months. Price may be a bit too high for some people. Some people complain these earphones don't have enough bass but that wasn't really an issue for me. The cables or kinda thin, feels cheap. If you don't handle them carefully they may break (inside) after a while. It ships with a wind-up pocket carrying case but this case is too big and not very convenient. I don't think many people will use it. Overall I like the Sennheiser MX 550 earphones because they sound really well. If you decide to buy these earphones keep in mind that the thin cables are pretty fragile and don't overuse the volume control or you'll need to go back to the store after a few months to get a new pair. Fortunately there's a 2-year warranty. JUST DO NOT BUY THEM!!! CRAP!!! TOO LIGHT EARPHONES.....AND remote's weight always pull the earphones out of your ear.....EXTREMELY ANNOYING!!! The remote control sometime makes the sound really revolting....that's why you must do not use it at all!!! Totally disappoint for all these money......my old pair SONY had much better bass, too!!! And the shape of the earphone is sooooo lame and supreme uncomfortable, make me an ear ache!!! I bought these to replace the Apple ones supplied with my ipod nano. I was disappointed with the result - the only benefit being the in line volume control – the sound wasn’t as punchy. After 10 months one channel died. I took them back to Comet for a replacement. The replacement lasted 2 months before a channel died again. Only the first pair was guaranteed so I'm stuck with a dud. I'm back with the Apple earphones and actually enjoy the brighter sounds these give. I wouldn’t buy MX550s again. I have had nearly the same model of headphones for over three and a half years now. I love them and one good piece of news for you is if your act like mine did then although they develop that problem with the volume control it never gets worse. It had acted that way for over two and a half years now.